Insight Cities Berlin runs two incredible tours that focus on the city’s buzzing art and creative scene. Check out our Kaleidoscopic Kreuzberg Tour and our Gallery Scene Walk, both of which get you up, close and personal with much of the art featured here. Tall walls scream loud and proud: 30 meter high murals adorn entire sides of buildings in Berlin. Elevated S-bahn trains snake through a cartoon jungle between buildings all through Berlin. See political puppet figures dancing on their strings amid dollar signs, all connected to a giant octopus consuming everyone. Defiant fists shake all over the urban landscape. These are Berliner stories writ large in living color. But these sprayed scenes of colorful chaos are not just window dressing for train commuters. This art doesn’t hide between four walls waiting for the art market to forge its value and peddle it to the rich. This is street art in Berlin. This is a public service announcement for anyone who wants to tune in. While most West Berlin neighborhoods hold a reputation for being full of stodgy, orderly old Germans with money, one area west of the Berlin Wall retains its street cred as a pocket of cool: Kreuzberg. This little cultural valley in Berlin has been the Shangri-La of counterculture youth since the 1970s. David Bowie and Iggy Pop shared a flat in Schöneberg, but they partied the night away in the SO36 club in Kreuzberg. When the Berlin Wall fell and the city was unified along with the rest of Germany, Kreuzberg was linked with the East Berlin neighborhood of Friedrichshain to form the district of Friedrichshain-Kreuzberg. Friedrichshain’s claim to fame is the legendary East Side Gallery, the only open air monument to both street art and the Berlin Wall era. This remaining section of the Berlin Wall was heavily sprayed with murals and graffiti all through the ’80s and ’90s. After years of damage and neglect, the wall was carefully restored to its original splendor by the artists themselves in 2009, marking the 20th Anniversary of the Mauerfall (Fall of the Berlin Wall). Kreuzberg was a melting pot of Turkish and Middle Eastern immigrants alongside a mosh pit of punks in the 1980s, right about the time the American graffiti movement hit the walls of Berlin. The working poor, punk squatters, and visiting rock royalty made for a heady brew of underground culture that still flows from every doorway and window of Kreuzberg. And the writing is literally on the wall. Some of the most famous street artists of Europe have graced Kreuzberg’s urban canvas, including Italian artist BLU and French artist MTO, who both lived and worked in Berlin for several years. BLU is best known for his massive murals covering the entire walls of four-storey buildings, like the old factories on Cuvrystrasse, or the walls near the Oberbaumbrücke. Sadly, two of BLU’s most iconic murals, ‘East-West’ and ‘Handcuffs’ have been painted over during the gentrification process happening in Berlin. You can still see BLU’s ‘Pink Man’ mural, a giant pink squiggling monster figure composed of hundreds of tiny humans being ‘fed’ to the monster’s gaping maw. MTO’s notable works are large black-and-white murals of famous figures like Jack Nicholson, Robert De Niro, and Spike Lee. Each character seems to pop out of a doorway or window and challenge you to a dialog or a duel. Just follow Oranienstrasse from U-bahn station Görlitzer Bahnhof for the open-air street art gallery equivalent of Hollywood’s Walk of Fame. Among the gritty backstreet squats of Friedrichshain, a sea of spray-paint-covered walls (and even windows) of many of the buildings along Riegaerstrasse. Friedrichshain was filled to the brim with punks, anarchists, and artists after the reunification of Germany. The buildings of this East Berlin district were badly neglected and damaged during the Cold War era, and many were completely abandoned after the Berlin Wall fell. This left a dearth of unclaimed flats to be inhabited by squatters, artists, and the working poor. The resulting street art explosion in the area gave rise to local legends like ALIAS, Prost, El Bocho, and more. You will know El Bocho by his trail of dead cartoon kitties, clutched by a googly-eyed girl. Prost leaves you smiling with happy face figures everywhere (called ‘Prosties’), and ALIAS paints lonely figures with covered faces or sad children playing with guns or grenades. One of the sacred safe havens of street art is Haus Schwarzenberg near Hackescher Markt. Just enter the passage beside the Café Cinema and immediately you’re ensconced in a vibrant sea of murals, paste-ups, and tags. 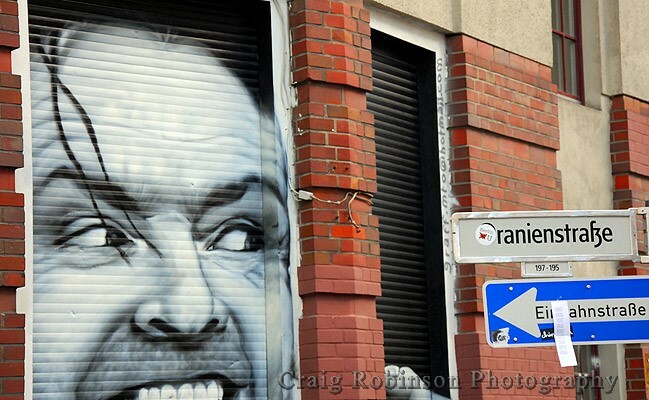 Here you’ll find the highest concentration of street art in Berlin, as well as galleries dedicated to street art, cafes pouring caffeine culture, and clubs filling in the wee hours of the night and morning. Treat yourself to a free feast for your eyes, but please support the locals operating the businesses in the Haus. And be sure to leave a nice tip.